Disappearance Diary is a fine example of the scope of Japanese Comics. Here we have a veteran of the craft writing a tale about the lowest point in his life, a truly touching life story about a human pushed to the breaking point, how his life is destroyed, and how he puts himself back together. 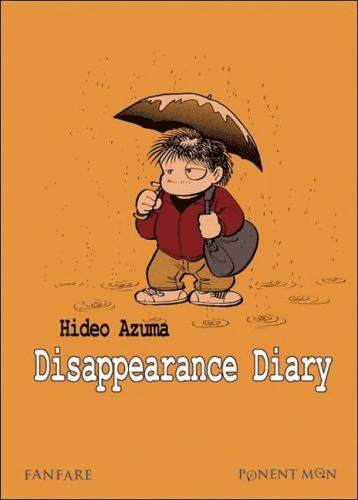 Disappearance Diary is an autobiographic work by the father of Loli-con, Hideo Azuma where he recounts the two times he ran away from his life; his career as a Mangaka; and his struggles with alcoholism. Disappearance Diary is a story told in three parts. There is no initial backstory, no history on the author at the start of the book. Azuma tosses you right into the first disappearance where he excuses himself from his studio claiming to go buy some cigarettes and simply does not return. The piece starts “This manga has a positive outlook on life, and so it has been made with as much realism removed as possible,” and the art work reflects that attitude. 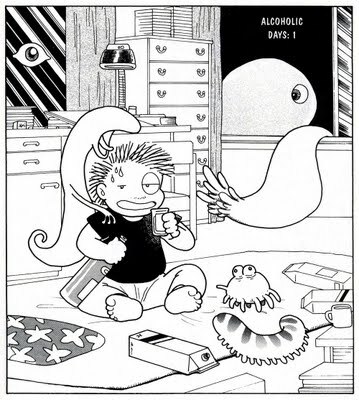 Azuma himself is a cute little character with stubby legs, ruffled hair, and a single large eye. The cute art helps soften the blow of the content, as intended, because it simply is less tragic to see a cute chibi Azuma sleeping in two inches of water than it would a photo realistic Azuma. In the first part Azuma leaves his studio and decides to live in the woods behind an apartment building. He survives by scrounging food from the trash and picking up cigarette butts off the ground. After the police find him and return him to his wife. Three years later he runs away again, this time sleeping in parks until he takes a job with a gas company laying pipes. He works for the company, his goal being to do anything to escape from the life of a Mangaka. Then the book recounts Azuma’s Manga career as he takes job on top of job, lives a life of sleepless nights, and is almost unable to say no as editors pile more projects on top of him. The final section of the book explores Azuma’s fall into Alcoholism and his time spent in the hospital in recovery. The title is becomes somewhat procedural because it is written in the form of a diary, Azuma goes over his journey step by step explaining the tactics he used to survive outside of civilization. The clever ways he uses the resources available to him to, for example cooking himself Ramen while avoiding the notice of a residents of a nearby apartment building, are a fascinating snapshot of homeless life. 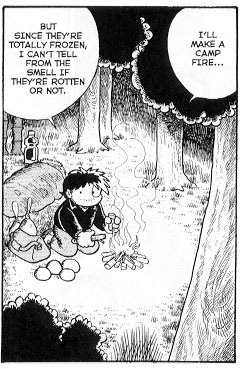 The first disappearance story is filled with his survival tactics and they are all bitter because the reader knows he is coming up with these clever tricks to avoid returning to his former life. He could simply go home and eat a warm meal, sleep in a warm bed but he chooses to sleep in snow just to maintain the feeling that he escaped from his life. The second disappearance is similar to the first, but Azuma meets a large number of interesting characters that he establishes expertly in just a few images and off the cuff phrases. One homeless beggar has the strangest goofy expression on their face which instantly that establishes them as a character that the reader is not supposed to take seriously. In the narration Azuma describes him as “odd” and the goofy expression works to reinforce that. The simply artwork is used like that in all the small characters Azuma comes across. Azuma’s partner in the gas company was a much hated womanizer. The first panel he appears, even before Azuma tells the reader who he is, the character boldly states “Banged another woman I pulled through phone dating yesterday!” while wearing a wide, stupid grin which instantly establishes his character type and attitude. 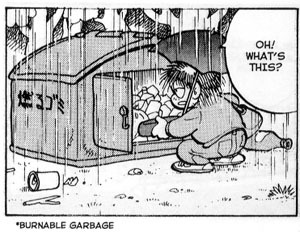 The reader immediately recognizes the world Azuma was entering as he shifts from artist to Blue collar labor. The effectiveness of the Disappearance arcs wouldn’t be nearly as powerful if not for the inclusion of Azuma’s history as a Mangaka. I was taken aback by the way the piece began, with Azuma walking out of his studio on his first disappearance, but as the story went on I came to accept that it didn’t matter why he decided to leave his world behind as long as the audience understood that this was a deeply broken individual. The process of unfolding his career is quick but effective and explains how fast he became overwhelmed by the amount of work, and in those few pages it clicks with the audience why Azuma would just drop everything and run away. It was a beautiful moment and an exceptional way to bring the back story into the narrative, the audience immediately understands the reason Azuma ran away after knowing the story of his experiences the desperation and sadness in the first two sections hits the reader all at once and Azuma becomes an absolute tragic character. The final piece tracks Azuma’s time spend in rehabilitation for Alcoholism. Using the same tactics he used to track his disappearances he describes the procedures though the ward expertly, he colors the people in the ward; no matter how tragic; in a cartoonish hue, and his telling of his experiences are in the same simple and cute art style in which depressing events are made less so by the lack of realism. What sets this chapter of the piece apart is that Azuma is not describing the selfish escapism of the first half of the book but he is describing his struggles with addiction. This is perhaps the lowest part of the author’s life and yet it appears on the page with cute art and a sense of humor. It is an amazing and rare accomplishment because while many artists go through drug rehab they don’t have the gall to write about it in such a light and humorous fashion. Azuma expresses to the reader how dark this part of his life was but also doesn’t shy away from making fun of himself at the same time. There is a general lack of characterization in the book, which suits the diary style that Azuma was going for. But we never get any actual detail on which Azuma is and apart from the quick sketches mentioned above all of the side characters lack any sense of depth. The most unfortunate out come at this is the lack of information on Azuma’s wife. She is constantly in the background and becomes Azuma’s constant assistant while drawing Manga. She is a woman who put up with her husband walking out and living as a homeless person twice, watched her husband work himself nearly to death, and saw him become consumed by alcoholism. Yet, we never are given a reason why she put up with him. What made Azuma a desirable husband? Why did she love him? I continue to wonder what made her stay with Azuma after the first time he walked out, let alone through Alcoholism. The biggest strength of the work might be how personal it is to the author. This is the story of the last ten years of his life and so while he wanted to get his experience out on the page the emotional turmoil that he and his wife went through is absent. It is impressive that despite that the piece remains a touching human story, and that proves Azuma’s skill as an artist. But the book could be so much richer if Azuma had shown how these events affected the people who love him, rather than simply showing us the events in a cold procedural manner. Disappearance Diary is a colorful look at the darkest moments of a man’s life. It’s heavy and depressing while at the same time maintaining a light and humorous tone. It is a wonderful experience and a look at the stress that Mangaka actually have to endure. At times it can feel a little procedural, when Azuma describes the processes he used to survive or the processes of the hospital, has weak characters, and lacks a deep emotional connection. But this is a Diary; as the title suggests, so those details give a sense of realism to the story rather than slow the narrative down. The piece shows the power and flexibility of the medium and should be on the shelf of any manga fan.